A big, green-and-white ferry veers, slows and then stops almost dead in the waters of Puget Sound, where, just around the point, the skyscrapers of downtown Seattle soar. To the west, the Olympic Mountains rise behind the low islands and fir-darkened shore, and to the south stands Mt. Rainier’s 14,000-foot snowy cone. But no one’s looking at the scenery. The captain has just announced that a pod of killer whales is heading north. Commuters, school kids and other passengers rush to the port-side windows. Black dorsal fins break the choppy water. Sleek black-and-white bodies curve up into daylight and back down below the waves. Some leap clear of the water, exciting all the passengers. Also called orcas—a shortened version of their Latin name—these marine mammals are icons in the Puget Sound area. Technically, this population is called southern resident killer whales. But they are not really whales. They are the largest members of the dolphin family. The name killer whales, twisted in translation, comes from Spanish whalers who saw them hunt whales and dubbed them whale killers. Orcas live in every ocean, traveling in close family groups known as pods. Many are doing fine, but the southern resident population—protected under the Endangered Species Act since 2005—is clearly in trouble with a population that numbers only in the 80s. Genetically distinct for 700,000 years, they do not breed with other populations and are culturally distinct as well. The southern residents communicate in their own dialect and dine almost exclusively on salmon. Other populations with overlapping ranges eat marine mammals, sharks, rays and more. The southern resident population got a push toward extinction in the 1960s and early 1970s, when Sea World and other marine parks realized that leaping, trainable, 20-foot sea mammals were crowd-pleasers. Whale hunters started rounding them up in Puget Sound, but public opinion quickly turned against the captures. In 1976, Sea World agreed to stop trapping in the sound, but lasting damage had been done. Sam Wasser, director of the University of Washington’s Center for Conservation Biology says that there’s still a hole in the population where females of breeding age should be and, by now, inbreeding problems likely exist. Other problems include toxic chemicals and, most worrisome, a lack of food. Southern residents don’t just eat any salmon. They prefer chinook, also called king, and their tastes match our own. When high-end Seattle restaurants offer salmon on their menus, they let diners know they’re getting “wild-caught king.” Killer whales presumably like chinook for the same reasons we do: Of all the Pacific salmon species, they’re the fattiest and grow the largest. Their size and fat content give an orca the greatest possible return on the energy spent foraging. Historically, the Columbia basin was a cornucopia for the orcas. Chinook, some weighing up to 100 pounds, swam 1,500 miles to the river’s headwaters in British Columbia. In the Puget Sound basin, another run of 100-pounders spawned in the Elwha River. But the giant fish are long gone. Not only are those 100-pounders long-gone, but whole chinook populations have gone extinct. Those from Puget Sound—and others in the Columbia, Snake, Willamette and Sacramento rivers—have been federally listed as threatened or endangered. Completion of Grand Coulee Dam in 1941 destroyed the Columbia River runs. More than 70 years earlier, people fishing—in an unregulated free-for-all from rowboats—had started Columbia River chinook on a long decline. The river’s chinook catch peaked in 1883. The waters were also cleaner in the good old days. Now, the National Oceanic and Atmospheric Administration labels the southern resident killer whales “among the most contaminated marine mammals in the world.” The southern residents eat contaminated fish, and they hang out near three large coastal cities, exposing them to pollutants from urban treatment plants and pavement runoff. Q: What is Defenders of Wildlife doing to help the orca’s of Puget Sound? A: First, we are working to reduce toxins in the orca’s home and food. Second, we’re focused on increasing or restoring chinook salmon habitat so that more fish can spawn, thrive and play their part in a complex ocean food web. Our work is focused at the county, state and federal level to pass legislation to reduce these threats and build public support for the orca’s continued recovery. Q: What’s the connection between dams and orca? A: The southern resident orca’s diet consists of more than 80 percent chinook. Simply put, it’s impossible to recover orca without restoring imperiled chinook salmon, too. Unfortunately, habitat loss and barriers to migration—namely dams—have decimated chinook populations in the Northwest. Hydroelectric dams in particular carry a one-two punch: They flood river and floodplain habitat and cause high mortality of juvenile fish as they pass through the dams to swim toward the ocean. 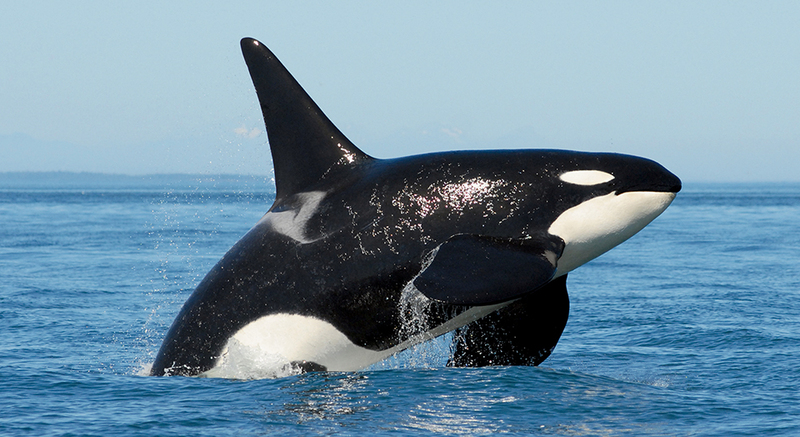 Q: What can you do to help orcas—even if you don’t live in the Pacific Northwest? A: No matter where you live, be mindful of what goes down the storm drain. The toxins we use are harmful to orcas, fish, other aquatic wildlife—and potentially to us. Toxins that run off our driveways, lawns, roads and roofs, flush into streams and rivers and ultimately the ocean. You can help by washing your car on your lawn instead of your driveway, running dish and clothes washers when it’s not raining, using less toxic cleaners, planting rain gardens to catch your roof runoff, using permeable pavers—rather than concrete or asphalt—for patios and driveways, fixing leaky cars, and using alternatives to traditional lawn fertilizers and pesticides. Flame retardants, used in many consumer products, are also fast becoming known for their health hazards to humans and wildlife. Support state and federal efforts to ban these dangerous chemicals, just like DDT and PCBs. Finally, whale-watching has become a big business. No matter what kind of marine mammal you are watching, make sure the operator is conservation-minded and is sensitive to endangered species protections. If you’re in a private boat make sure you don’t get too close and never follow a marine mammal swimming away. This causes the animal to expend energy, increasing the need for food and decreasing the opportunities to find it. Toxins accumulate in fatty tissue, which is why Washington state warns people to avoid eating chinook caught anywhere in the southern sound more than once a week. An orca eats up to 300 pounds a day. And eating less wouldn’t help. If they have plenty to eat, the chemicals stay in their fat, but if food is scarce, the story changes. “As you start running out of food, you metabolize your fat,” says Wasser. This gets the toxins flowing through the body. The three pods of whales that make up the southern residents populations, identified as J, K and L by researchers, have varying levels of toxins in their system. Members of J pod, which spends the most time within Puget Sound, carry extremely high burdens of PCBs—largely banned in 1979—and other substances washed into the sound by stormwater. K and L pods, which spend less time in the inner sound but swim down the coast to Point Reyes National Seashore and Monterey Bay in California, carry fewer PCBs but a lot more DDT. Also largely banned in the 1970s, DDT remains in marine ecosystems off the Oregon and California coast, where rivers and streams carried it from inland farms. It’s the reason Defenders is studying ways to incentivize responsible action on derelict and abandoned vessels in the Northwest—from private recreational boats to old fishing vessels and decommissioned Navy ships. Abandoned boats eventually sink, and depending on what’s on board it can be incredibly hazardous to marine wildlife. Preventing the boats from being abandoned in the first place eliminates the hazard and is less expensive overall. Defenders is also working with a broad alliance of local, regional, national and international conservation groups to bring attention to the plight of orcas and the salmon they depend upon for survival. “Many people are unaware how closely tied the southern resident orcas are to salmon, and getting that message delivered to the right people is the first step,” Ruther says. To halt the decline of chinook and other salmon species, conservation scientists agree that we have to deal with the “4 Hs”: hydro, habitat, hatcheries and harvest. “Hydro” means dams with turbines that convert the energy of moving water to electricity. The nation’s two largest hydro projects stand on the upper Columbia River, barring salmon from spawning streams in Canada. Four less-imposing dams on the lower Snake River depress the survival rate of salmon populations in the Snake and its tributaries, including the fish that Wasser terms incredibly nutritious. Many of the Columbia Basin’s spring chinook spawn in the Idaho wilderness, where the high elevation may enable salmon to flourish even if climate change makes stream temperatures in the rest of the vast watershed too high. The idea of taking out a sizable dam is controversial but no longer unthinkable. The two dams that long blocked the Elwha River were recently removed, making the Elwha the model for what can be done. As soon as the dams came out, people saw chinook spawning upstream in Olympic National Park. “Successful dam removals show us it’s time to take inventory of all dams in salmon country, hydro or not, and figure out which were a mistake, have outlived their usefulness, are more expensive to maintain than remove, or would just plain give salmon the habitat back that they need to survive,” says Ruther. Chinook developed in dam-free rivers with braided channels, log jams and wide, soggy plains into which the water periodically spilled. University of Washington geologist David Montgomery has argued that these floodplains could again be “salmon factories.” He says the most cost-effective way to get a lot more salmon would be to buy land or rights in those floodplains that aren’t yet extensively developed, and let the rivers be rivers once again. Along rivers now diked and channeled, hatcheries crank out fish for the short-term benefit of commercial- and sport-fishing activities and for tribes with treaty rights. This produces fish that compete with native populations, reducing genetic diversity—which may be the salmon’s best hope for surviving climate change—and the chance that wild gene pools will endure, say researchers. Catching salmon for fun or profit isn’t necessarily bad, but regulators often allow an “incidental” catch of imperiled salmon in more robust runs. “Sustainably caught” salmon can also include fish from threatened and endangered runs. When the fish are divvied up among human interest groups, neither killer whales nor future generations get a seat at the table. She also cautions that preliminary findings from new research suggest that first-time orca moms experience high rates of miscarriages and stillbirths, or they lose their first-born shortly after birth because of higher levels of development-disrupting toxins in the milk firstborns receive. Daniel Jack Chasan writes about conservation issues in the Northwest from his home near Puget Sound. Only select articles from Defenders are available online. 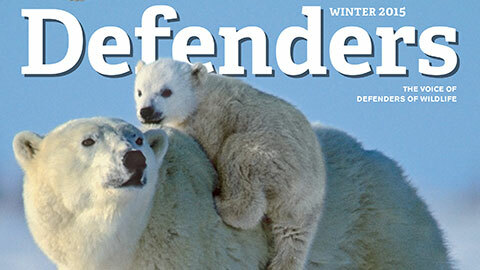 To receive 4 issues annually of the full award-winning magazine, become a member of Defenders of Wildlife! Each spring, during high tide at Alaska’s Copper River Delta, thousands of western sandpipers cluster at the edge of the salt grass in mats as tight as the weave of a carpet. Coexistence is the order of the day in Oregon, thanks to months of discussions among Defenders of Wildlife, Oregon wildlife officials, the governor’s office and the ranching community. A livestock compensation and wolf coexistence bill unanimously passed the state House and Senate and was signed into law by Gov. John Kitzhaber in August.